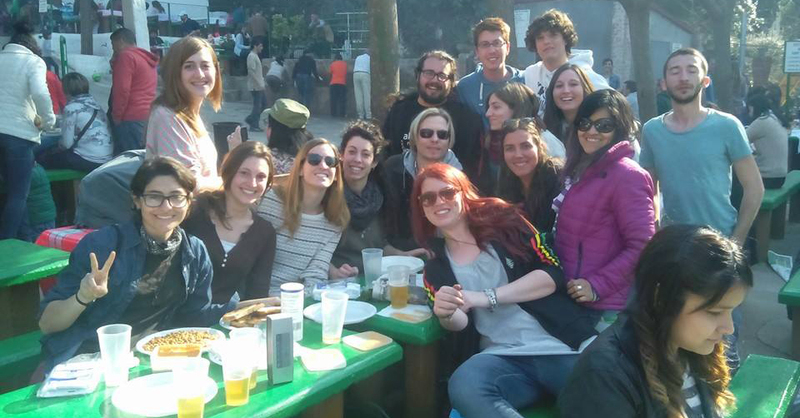 Last Saturday March 9th 2014, a group of members of the BCN SGA-Student Chapter spent the day together celebrating a “calçotada” in a picnic area near Vallvidrera. We ate “calçots” - a late-winter vegetable typically eaten in Catalonia - grilled meat and “botifarra” and also some sweets. It was a great opportunity to have a nice day chatting and playing, out of our everyday routine. 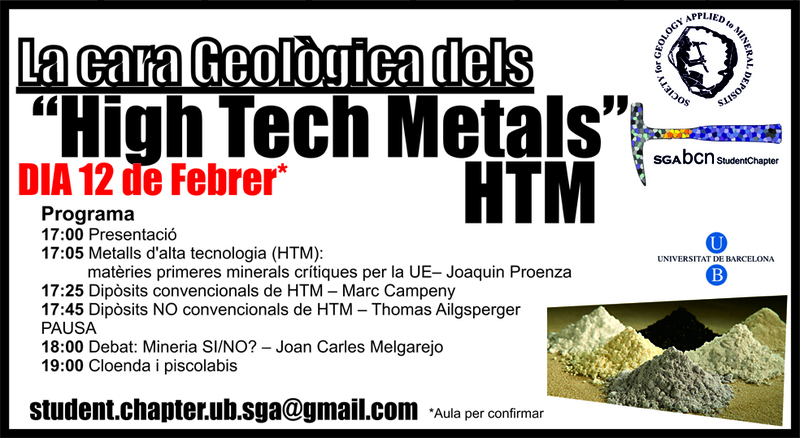 In connection with the exhibition about Hight Tech Materials held at our Faculty, the BCN_SGA Student Chapter organizes this activity on Wednesday February the 12th. It will consist of several talks devoted to a better understanding of the geological side of these materials. The activity is thought as a plain explanation of the importance of these elements and materials as essential for our society. The geological setting of convencional and non-convencional deposits will be introduced. The activity will close with a promising debate entitled Mining YES/NO. 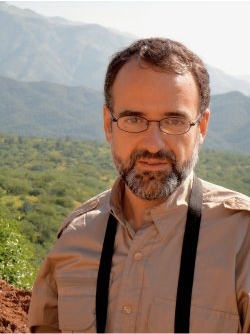 Lecturer: Dr. José María González Jiménez (Geochemical Evolution and Metallogeny of Continents (GEMOC); Dep. Earth and Planetary Sciences; Macquarie University, Australia). In the upper mantle, the platinum-group elements reside mainly in specific minerals known as the platinum-group minerals (PGMs), and to a lesser extent dissolved in base-metal minerals (including Fe-Ni-Cu sulfides, arsenides) and alloys. They vary widely in distribution, morphology, and chemistry and Os-isotope compositions, suggesting different possible origins. The remarkable abundance of these minerals in chromite-rich rocks may reflect the role of chromite as a physical “collector” of the platinum-group elements during crystallisation of both phases from melts. However, despite a great body of work, the links between the PGMs (and their associated base-metal minerals) and the mechanism of formation of their host chromitites are still unclear and hotly debated. 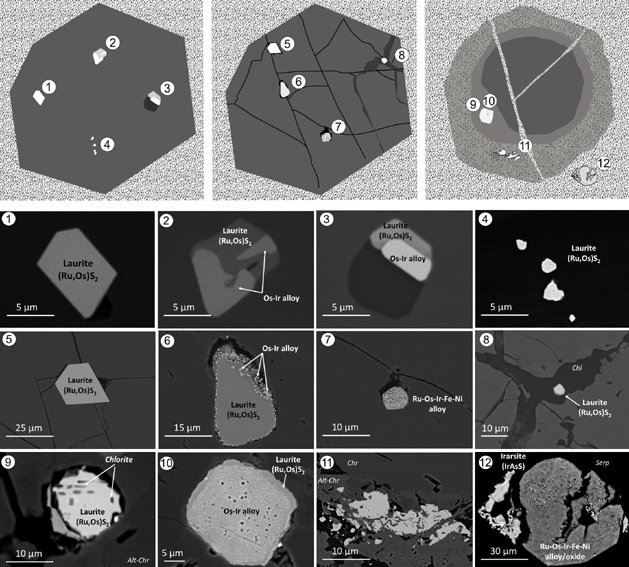 Platinum-group minerals found in the upper mantle chromite-rich rocks show significant Os-isotope heterogeneity on the scale of single micrometric grains enclosed within individual chromite grains. This micro-scale isotopic heterogeneity, and their random spatial distribution within the chromites, argues strongly against an origin of the platinum-group minerals via exsolution from the chromite lattice during post-magmatic cooling. A re-interpretation of their microstructures and Os isotopes analysed in situ had led us to review the traditional models, and to propose several origin(s) for the platinum-group minerals in chromitites. (1) The suites of platinum-group minerals mainly record crystallisation during mixing of multiple different melts and physical entrapment in chromite. (2) Some platinum-group mineral sin chromitites may have been scavenged from wall-rock peridotite during migration of the parental melts of the chromitite. (3) Other platinum-group minerals may have precipitated from metasomatic fluid/melts that infiltrated existing chromitites. The recrystallization of pre-existing platinum-group minerals during polyphase metamorphism or “recycling” of the chromitite into deeper mantle levels can explain the presence of micrometric platinum-group minerals with distinct Os-isotope compositions, associated with minerals such as chlorite. Our colleagues from Nancy organized a workshop about Uranium that took place in Nancy on December 12-13th, 2013. Many participants from all over the world attended the workshop. 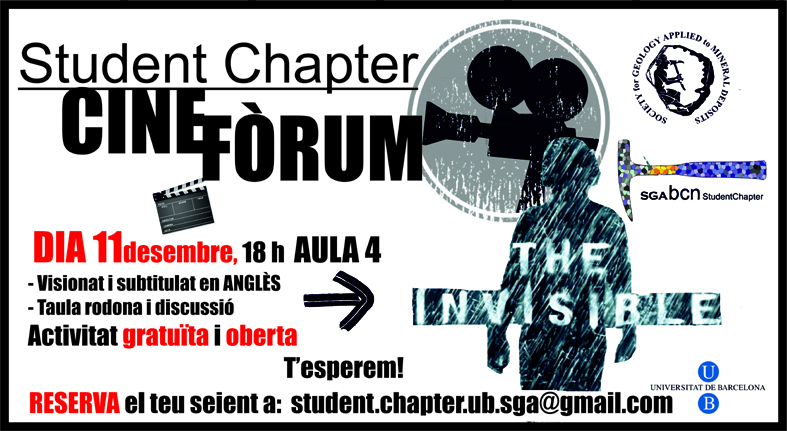 Belén Torres Cueva, member of the Barcelona SGA Student Chapter participated in the workshop as representative of our association. Belén, recently graduated, is about to commence the Master in Geology and Environmental Management at the University of Huelva. During the first day of the workshop, talks started with an introduction about the uranium cycle over time followed by the exposition of examples of some important uranium deposits in the world. During the day there was also time for coffee breaks, lunch and an interesting poster session. The second and final day of the Uranium Workshop, two PhD students exposed their researches. One was about the cycle of uranium and the tectono-metamorphic evolution of the Pan-African orogenic belt of Lufilien (Zambia) and the other session was about The formation of Roll-front deposits in the Erlian basins, China. This amazing Uranium Workshop concluded with a refreshment and lunch. 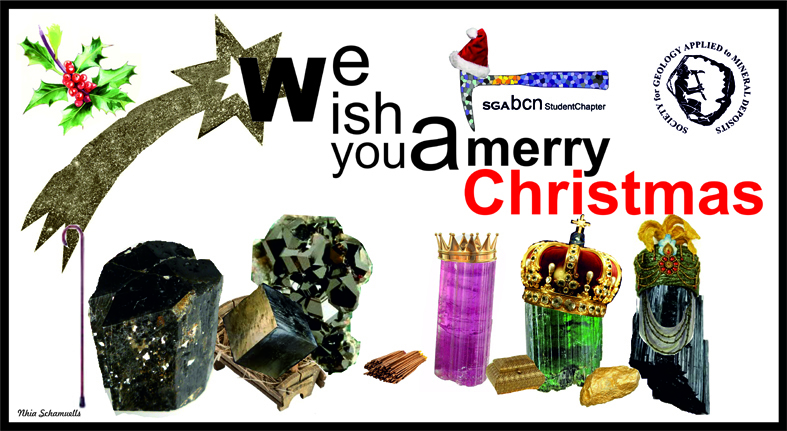 The Barcelona SGA Student Chapter wishes you a merry Christmas and a happy new year! 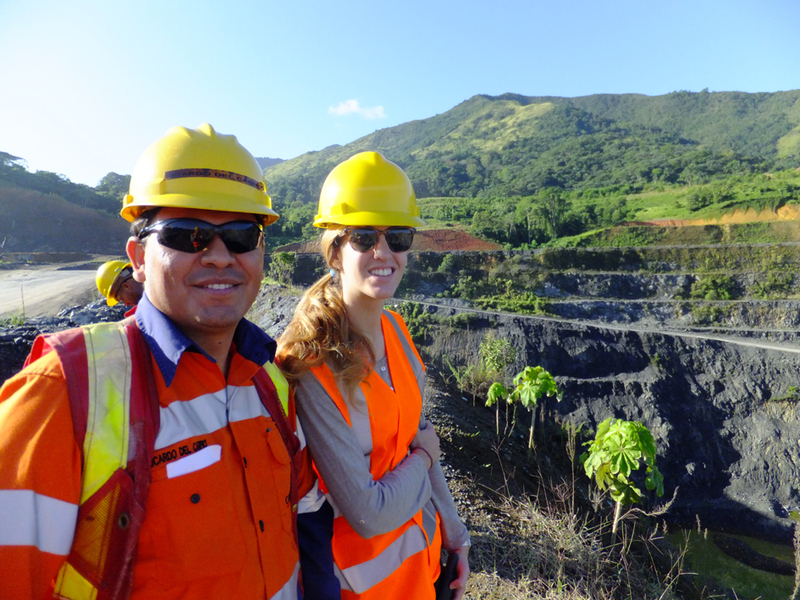 During three months, Lisard Torró, our president, has developed a fieldwork campaign in the Dominican Republic thanks to a grant awarded by the SEG (Society of Economic Geologists). This work is part of his PhD Thesis research about the metallogeny of metallic deposits in Cordillera Central in this country. 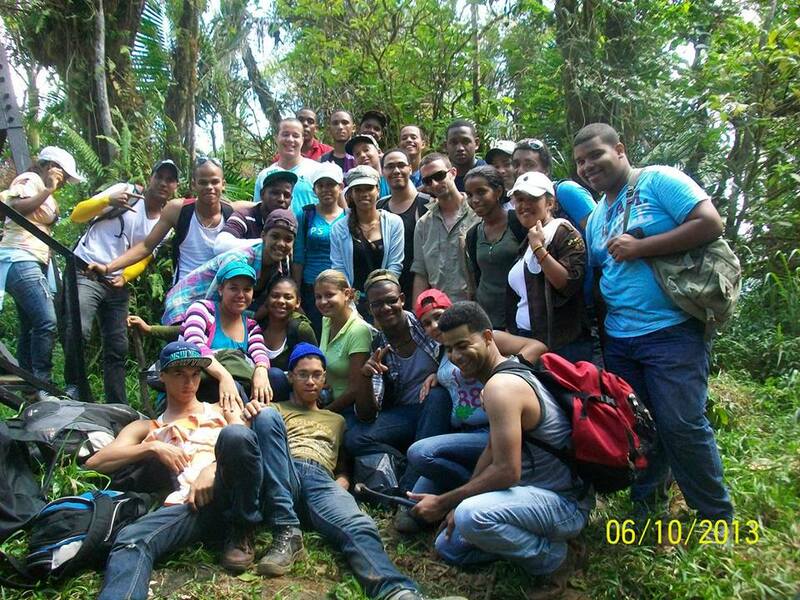 The main part of the stay was devoted to developing a detailed mapping and sampling in the Los Ranchos Formation materials close to Cotuí city area; with the purpose of finding the fresher outcrops, several tens of rivers and arroyos were gone over, machete in hand. The other part of the campaign was developed in the Cerro Maimón mine and surroundings and consisted of both fieldwork along several rivers and the logging and sampling of drill cores from new prospects in Maimón Fm. and Bayaguana areas. During his stay, Lisard taught two subjects at ITECO, the unique university of the country with a program in Geology. A total of 42 students had to bear his lessons! Júlia Farré, a last-year student of Geology at UB and the 4th year Student Committee of our Student Chapter, had also the opportunity to work in Dominican Republic in order to develop the fieldwork related with her Final Degree Thesis about the petrology and geochemistry of the most deformed rocks in the Maimón Formation; this Formation hosts the Cerro Maimón mine, currently the only VMS deposit under production in the Caribbean. During the week she spent there, a comprehensive field and core sampling was carried out. Both insist to stress their gratitude to all collaborators (SEG, CORMIDOM-PERYLIA, EVERTON and individuals) that allowed them to develop an essential part of their research as well as, although the hard work carried out, to live a superb vital experience. 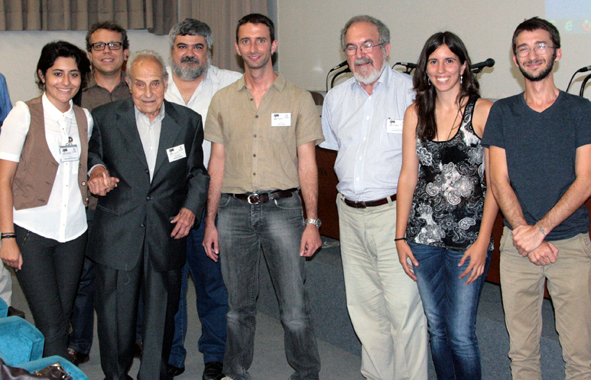 During the second workshop organized by the BCN-SGA Student Chapter (University of Barcelona, 19th-21st September 2013) a well-deserved homage to Antonio Arribas Moreno was celebrated, to honour his career and his contribution to the study and research in the field of mineral deposits. Antonio Arribas Moreno was born in Madrid in 1922. He obtained the degree of Natural Sciences in 1948 and afterwards he graduated in Economic Geology in 1961 in the University of Madrid. Even so, his entire academic career was developed at the University of Salamanca where he founded the department of Crystallography, Mineralogy and Ore Deposits in 1965 – the first official Ore Deposit department settled in the Iberian Peninsula. He was the dean of the School of Sciences from 1970 to 1987 as well as the director of the Spanish Institute of Applied Geology from 1980 to 1987. During his academic life he directed more than 125 final degree projects and around 35 PhD Theses, and worked with people from all around the globe. Antonio, without a doubt whatsoever, is one of the fathers of Ore Deposit research in the Iberian Peninsula and other territories such as the Western Sahara, where he supported until very recently several field investigations in collaboration with students and professors from the University of Barcelona. For all these reasons together with his kind personality and neverchanging young soul we are extremely pleased to present Antonio Arribas Moreno as the Honorific Advisor of the BCN-SGA Student Chapter. Talk by Antoni Camprubí: IOCG deposits in Mexico: more questions than answers? Title: IOCG deposits in Mexico: more questions than answers? Abstract: Magmatic-hydrothermal iron oxide deposits, or IOCG "clan", are a group of ore deposit types that formed in a wide range of tectonomagmatic environments and depths of emplacement: from intra-arc or back-arc environments to those related with anorogenic magmatism (even in association with carbonatites), and from near-surface to deeper than 10 km deposits. The occurrence in Mexico of these deposits spans from Lower Cretaceous to Miocene examples, whose minimum distance from their respective hypothetical subduction trenches in the Pacific convergent margin suggests the existence of at least two groups of IOCG types of deposits from the tectonomagmatic standpoint. On the one hand, there is a large amount of these deposits located near the edge of the present Pacific coast, running from the Baja California peninsula to the state of Chiapas. Such distribution is very similar to that of similar deposits in the Andean coastal ranges, and suggests that their formation might have occurred in a similar setting, likely to be due to extensional intra-arc magmatism. The latter would have fringed the buildup of continental crust prior to and simultaneously to part of the Laramide orogeny (~80 a 40 Ma), which ultimately deactivated the formation of IOCG deposits and led to the formation of other types of ore deposits. On the other hand, many other IOCG deposits are clearly distal to the Pacific margin before the Baja California rift-off, between ~500 and ~1000 km inland. Such is the case of the Eastern Mexican Alkaline Province (EMAP), which formed entirely in the Cenozoic and also contains carbonatites. This feature suggests additional tectonomagmatic environments for IOCG formation in Mexico, which also occur in the Cordillera of Western North America, but not in the Andes. The EMAP as a whole poses an interesting topic for further research in the metallogeny of Mexico, as its tectonomagmatic setting remains ill-defined to date. 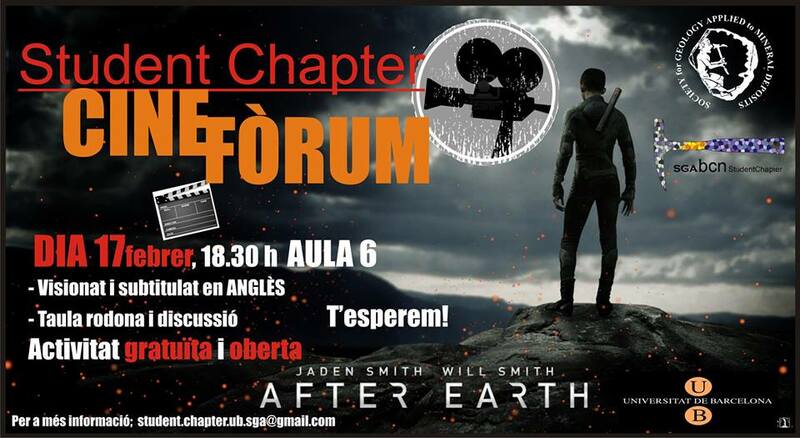 Date: Thrusday October 17th 2013. 11:00A.M. Abstract: There are currently about a dozen gold deposits that exhibit evidence for an origin at or directly beneath the paleo-surface. Collectively referred to as “Hot Spring” deposits, they were first recognized in 1980 with the discovery and recognition of a near-surface origin for the McLaughlin gold deposit (3.2 Moz) in California. Since then, additional discoveries have been made and unequivocal evidence for a hot spring origin has been recognized at other gold deposits in the Circum-Pacific region. Such evidence includes silica sinter, deposited originally as amorphous silica in hot spring pools and terraces, and, aprons of hydrothermal eruption debris which thicken and coarsen toward a central hydrothermal eruption vent. Mineralization typically consists of microcrystalline quartz, minor adularia, several percent pyrite-marcasite and native gold hosted by central, higher-grade, hydrothermal vent breccias and surrounding, lower-grade, quartz vein stockworks. A blanket of advanced argillic alteration, consisting of cristobalite - alunite – kaolinite is superimposed, when present, on ore-bearing sulfidic silicification. Precious metal mineralization in hot spring deposits is the result of shallow boiling of the hydrothermal fluid. Episodes of high fluid throughput steepen the pressure gradient in fossil geothermal systems, raise the boiling level to near grassroots levels and result in shallow precious metal mineralization along with a steeply zoned suite of associated “pathfinder” elements (Sb, Hg, Tl). Congratulations to our new council!